Another Broward County judge is facing a DUI charge following a crash with a parked patrol car in a Fort Lauderdale courthouse parking lot Tuesday morning. Judge Lynn Rosenthal, of the 17th Judicial Circuit, was arrested after the incident in the parking lot at 201 Southeast 6th Street, Broward Sheriff's Office officials said. According to the police report of the incident, deputies said the judge's SUV hit the driver's side rear bumper of the unmarked patrol vehicle that was parked. Deputies said the SUV then continued towards the judicial parking lot and hit the security gate. The police report said the SUV then was put into reverse and struck the gate several more times before the deputies were able to contact the driver. Broward County attorney Bill Gelin was the first to post the story about Rosenthal’s arrest Monday morning. A Broward County Judge arrested after an accident Tuesday said she took an Ambien CR the night before the accident/arrest. “Simply went down to the third floor and you could see down there, you could see the judicial parking lot and there was this BMW SUV with the police all over the place,” Gelin said of the incident. Deputies said in the police report that Judge Rosenthal then got out of her vehicle and "appeared unsteady on her feet, her speech was slurred and she had difficulty obtaining the required documents." However, deputies said they did not detect an odor of alcohol on the judge’s breath. When advised deputies were conducting a DUI investigation, Judge Rosenthal told law enforcement she “had not consumed any alcohol for a long time,” according to the police report. Another Broward County Judge was arrested for DUI on Tuesday, bringing the total to three in the last seven months. The police report said Judge Rosenthal told deputies that she had been involved in another accident on I-595 earlier in the morning. She said a truck had tried to run her off of the road and she had video of the incident on her cell phone. When Rosenthal showed the investigating deputies her video, her SUV was seen “drifting between lanes and over the solid yellow lane line into the breakdown line” and eventually it collided with the concrete barrier wall, according to the police report. Deputies said they never saw a truck or any other vehicle influence her driving. Judge Rosenthal agreed to a field sobriety test and said she was not injured, but had taken an Ambien CR at 10 p.m. Monday. NBC 6's Steve Litz has the details of another Broward County judge was arrested Tuesday morning. During the sobriety test, deputies said the judge failed to maintain balance during instructions, missed all heel-to-toe steps, raised arms to maintain balance, stopped during turn to request instructions to continue the exercise. The judge also had problems standing on one leg, according to the arrest report. 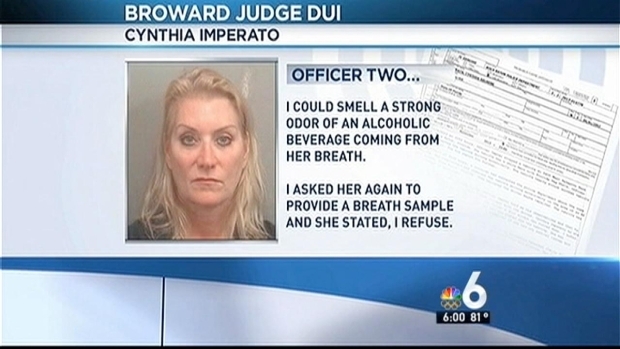 When the judge was given a breath test for alcohol, she blew a .000 on two tests. Judge Rosenthal refused to submit to a urine or blood test. She was arrested for DUI and a traffic offense-DUI and damage property. She was taken to the BSO Main Jail and her cell phone was taken as evidence. A Broward County judge is facing DUI charges following her arrest in Plantation Thursday, authorities said. 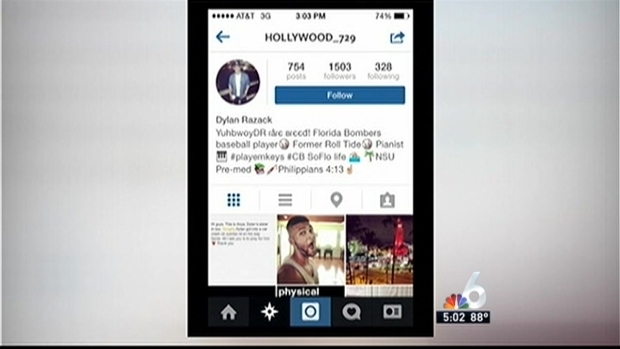 NBC 6's Justin Finch has more on the arrest. The arrest left some attorneys questioning the judge’s ability on the bench. “It calls into question whether you can have a judge be fair and impartial when in fact they are having to deal with the same type of criminal conduct in their own personal life,” said assistant public defender Gordon Weeks. Rosenthal was booked into the main jail Monday afternoon and bonded out of jail at some point later in the evening. A long-time Broward County judge was arrested on a DUI charge after she was spotted driving erratically and nearly hit another car in Boca Raton, police said. NBC 6's Willard Shepard reports. Her arrest is the latest in a string of embarrassing problems for judges in Broward County. Just last week, fellow Broward County Judge Gisele Pollack was suspended from th bench without pay after she was arrested on DUI charges earlier this year following a car crash. In November, long-time Broward Judge Cynthia Imperato was arrested for DUI in Boca Raton.